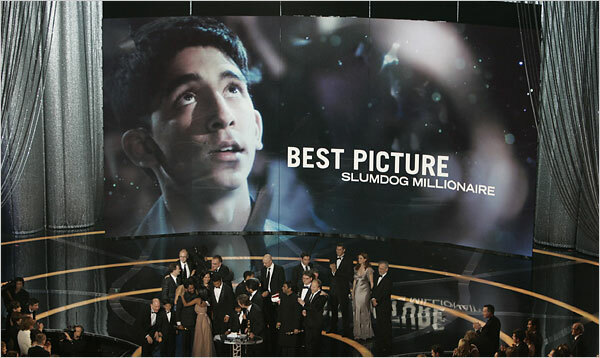 Why Did Slumdog Millionaire Win Best Picture? February 24, 2009 / J. Ott / Comments Off on Why Did Slumdog Millionaire Win Best Picture? Why did Slumdog Millionaire win Best Picture? You could as well ask why did Barack Obama win the Presidency of the United States. It’s a convergence of a multitude of cultural forces and historical influences — in other words, complicated — and I intend to tease out these strands if only to understand for myself how it came to be that so many Hollywood outsiders stood at the center of the Kodak theater to receive Hollywood insiders’ highest honor. Even once it was nominated for Best Picture, you might’ve expected it to occupy that fifth slot that seems to be reserved for sentimental favorites or indie darlings who are just happy to be there. Yet why did the buzz before the Oscars conclude, rightly, that the Slumdog‘s David was a Goliath, an odd-on favorite to win? Slumdog Millionaire got no nominations in the acting categories, an important distinction, since the majority of Academy voters are actors. Actors like to award actor-showcasing movies, as recent winners Crash and The Departed show. If you don’t believe the actors have veto power, witness how Mickey Rourke had won every major award for Best Actor this year for his performance in The Wrestler except the Screen Actors Guild Award, which was won by Sean Penn. Sean Penn took home the big prize last night. Like its main character, Slumdog was an underdog who overcame these obstacles to succeed in the end. Academy voters, much like regular movie-going audiences, fell in love with Slumdog and were able to overlook its faults (the acting is uneven, compared to an acting powerhouse like Doubt) or their own prejudices. On the count of prejudices, I don’t think we can be surprised. This is the same organization that gave a Best Supporting Actress Award to African American actress Hattie McDaniel in 1940. (Never mind that it was for playing ‘Mammy’ – when considered in context, still a progressive act.) This is not to say that the Academy was awarding Slumdog to make some sort of political statement. This is to say that the same body that can give a Best Song Award for “It’s Hard Out Here for a Pimp” is able, from time to time, to put aside the prejudices we assume. I think, personally, that Slumdog swept prejudices away with its boisterous, universal appeal. The story of Slumdog is as classic and universal as you are likely to find, though it is set in a world very foreign to the mostly white and wealthy Academy voters. First of all, it is a rags-to-riches tale. Into the drama of a real gameshow that has proved to be internationally appealing, Who Wants to Be a Millionaire, steps an unlikely contestant: Jamal, the eponymous slumdog, a kid whose whole tragedy-filled life has, by fate, fortuitously prepared him for each question. And as we flashback to see how the events of his life gave him the knowledge to answer these gameshow riddles, we also get another story — of his relationship with a brother who protected him, but had to turn to crime to do so; and love story that begins when he meets a fellow slum orphan when they are both just children. They are star-crossed, though she has been taken in by the callous crime-lord who rules the Bombay slums. So we’ve got our Dickensian rags-to-riches story, interspersed with a storylines of both brotherly and destined love, all hung on the proven drama of the most successful gameshow of all time. Though it strains plausibility, perhaps, the story, simply put, is like the plot version of heroin. It goes straight to the pleasure center of the movie-goer brain. Slumdog Millionaire was more than just a crowd-pleaser, it was a crowd-mover. But was this enough to win Best Picture? I think the story, winner of Best Adapted Screenplay, uncoincidentally, was the major factor. But it was not the only one. The (mostly young) cast, despite not being nominated for awards, had an adorable charm and showed real potential (I think the little boys, who played the young brothers, were especially good) and that certainly helped but the Academy’s actor voters at ease. But in the other categories, under the brilliant direction of Danny Boyle, the movie really showed that it can stand at the same level as previous Best Picture winners. The Academy doesn’t always recognize movies that, in terms of technique, are at the cutting edge. Citizen Kane is a famous oversight. But Slumdog is an exception. What Cinematographer Anthony Dodd Mantle (Winner of Best Cinematography, by the way) did was amazing. He took a brand new (at the time, unreleased) digital camera called the SI-2k mini and designed a rig that allowed the lens to be separated from the body of the camera, making a whole new range of camera moves possible in the tight corridors of the real Mumbai slums. This is in addition to shooting a great portion of film on traditional film. The movie has a number of extreme and colorful looks that help support extreme and colorful emotional states of the characters. The kinetic camerawork, combined with the kinetic editing (also a winner, Best Editing) made the movie rifle along to its potent climax. And it is AR Rahman’s kinetic songs, “O saya” and “Jai ho” (both nominated, “Jai ho” won) along with his wonderful score (also a winner) — which points to a new direction in film scoring that mixes classic Hollywood and classic Bollywood with modern hip-hop — that ties the whole film together. I imagine a movie with the same pace and music, showing only beautiful shots of the blighted slums, would beat Koyaanisqatsi any day. So how fitting that Danny Boyle, who borrowed Bollywood elements, but essentially directed the story in a Western way that the Academy didn’t have to stretch too far to embrace, took home Best Director. I don’t think he has a particularly light touch when it comes to directing, but thankfully there is nothing about this larger-than-life story that required a light touch. The movie also had an epic scope (many locations over much time) that helped it hold its own against the major strength of rival Best Picture nominee The Curious Case Benjamin Button. When you see how many major categories the Academy already felt the movie to be The Best in, the actor categories start to look less important. The big stars would win those, for their roles in big star vehicles. But those films’ stories never made us smile and cheer quite like Slumdog Millionaire did. And their technical feats in support of those stories didn’t shine like the raucous and infectious contributions of Slumdog international collaborators.